Health concerns -- not politics -- kept Georges St-Pierre out of the UFC 167 postfight press conference, according to the UFC president. 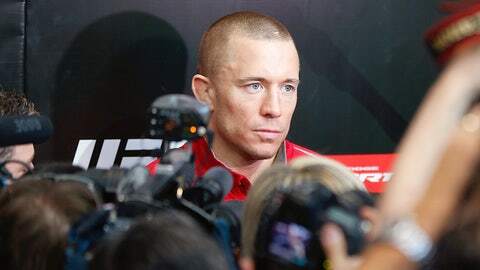 Georges St-Pierre made the news twice on Friday: once because of his decision to vacate the UFC welterweight championship, and again after a story he told about being kept away from the post-fight press conference following his recent UFC 167 win over Johny Hendricks. According to the story that was originally reported in the Canadian media, St-Pierre was barred from speaking his piece to journalists. But White said that wasn’t true, and that UFC staffers were simply looking out for his health. Fighters who compete in a particularly grueling battles are often sent to the hospital for precautionary reasons, and the idea was to have him bypass the presser for that reason, White said. "When he was trying to go to the press conference, the doctors were telling him no, that he had to go to the hospital," White said. "He was saying no, he wanted to go to the press conference." I just wanted to clear that stupidity up. But White reiterated that no one was purposely trying to keep him out, no matter what message he was going to deliver. Remember, just minutes earlier, St-Pierre had dropped a bombshell in the ring, saying he needed to walk away from the sport for a little while. St-Pierre eventually made it up to the dais, saying that he needed to take time off for personal reasons, although declining to elaborate on what exactly they were. At the time, White was upset with the decision, saying St-Pierre owed the promotion, its fighters and fans a rematch. White has gone on to characterize his own response as a "meltdown," but insisted he didn’t purposely try to keep GSP from another microphone. "We don’t tell guys you can’t go to the press conference," he said. "We never told guys you can’t go, especially Georges St-Pierre. Nobody’s going to tell Georges St-Pierre after a title fight that he can’t go to the press conference. I just wanted to clear that stupidity up. There’s always some conspiracy theory like I was mad so he couldn’t come to the press conference. A little bit was lost in translation there when Georges was telling that story."